Roz, you are so breathtaking. 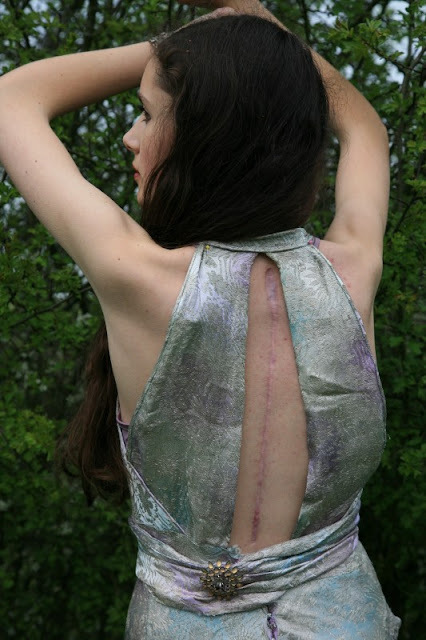 I love the photo of the back, showing the soft, feminine dress and the hardness of the scar. Dylana is right, it's a sign of strength. Just beautiful. You look lovely. A sign of strength indeed. This dress is so freaking gorgeous on you! You look amazing. I love your scar showing through the back like that. My cousin has had back surgery a couple of times in recent years due to scoliosis and I can't imagine the pain and discomfort. Your post is beautiful. you look absolutely stunning, and I was just gonna say that you looks like an old hollywood movie star, so don't worry, it's a good cliche. Also I wanted to tell you that I have a scar on my all across the side of my neck that I got when I had a tumor removed from my face at the age of 14. I always liked my scar however, it made me feel like I had done something, I had been through something, and I had survived. I love your scar, it shows how much strength such a delicate and beautiful person can have! and I love the dress. SO elegant! makes me want to go dress up right now for no reason! I love dressing up for no reason! Oh, how beautiful! Definitely pre-golden age, straight out of hollywood (or Gosford Park!) I love the bias cut, I'm jealous! I wanted to add how much i admire your courage throughout all of this, it's inspiring. You look like a goddess in that dress! I commend you for showing us what makes you beautiful and the body marks that represent your triumphs through hardships. beautiful, courageous, and strong. you have so much to be proud of. This dress is really gorgeous!! so brave of you to embrace your scar, i love the cut of the dress and love your clutch! you look stunning! i could only imagine what you experienced going through surgery and all, as i have scoliosis myself. your scar is a true symbol of courage and encouragement to us all - a sign that someone can go through such pain and come out glamourous and beautiful! Love, love, love the dress on you. It seems to have been made specially for you, scar frame and all. Will you show us your closet sometime? I am so curious about how you store all these beautiful clothes. The dress is stunning on you. So happy that you are proud of your scar! From the looks of it, I can tell you are healing very well! You always amaze me dear! Amazing. Everthing, You, the dress, the pictures and your strength to show and frame your scar like this. And yes to the last paragraph. Amazing. Just amazing. I wanted to thank you for such an inspiration. It's priceless. You show us how to wear clothes from past. You're so classy, stylish & beautiful! And as someone told so : it's good that you aren't afraid of showing your scar! You are so brave and such an inspiration! This is just my dream dress. It's Jean Harlow and Carole Lombard and everything that was elegant and seemingly effortless about that Hollywood style. The design and fabric are so sensuous without being revealing. You don't have to worry about anything slipping out of place. The real beauty though is how it frames your scar and how courageous and comfortable you are in sharing it with us. Beautiful images! Roz, your courage and strength are both admirable and I can't think of any better way to let that shine through than in this beautiful dress. You exude elegance! Looking forward to catching up on all of your posts I missed whilst away - the last one I saw was "Oh you pretty things". 'During high school, Puckrik was diagnosed with scoliosis, a curvature in the spine. She ended up having 10 vertebrae fused and a metal rod put in her back, spending a total of nine months in a plaster body cast. "I definitely marched to a different drummer. I was the kind of kid that would raid Pennywise thrift shop in Vienna and get my whole funk, vintage wardrobe for $3." So I just thought I'd mention her and pass on her positive words, and the fact that she's in several youtube videos discussing and reviewing perfume, which I'm sure are well worth a watch if possible. You are absolutely amazing... I love what you do, especially your pure honesty. It makes me so happy to know that there are people like you and your family around. I know I should be talking about the scar, I find it hard to believe that you have been through that and still seem to be such a normal happy young woman. My favourite thing about this post though, has to be your tree house renovation comments. I love that you can be walking around in high heels and vintage evening gowns, and attend London Fashion Week parties yet still be interested in playing with your little brother and building tree houses- and not be shy to tell us about it. I love love love that! I hope you're never afraid to trust your gut instinct throughout your life- from the little I know about you, I'm pretty sure you'll always make things wonderful. You are looking stunning in that dress!! My dear Roz, I am amazed; although not surprised at how you know that scar, even when it fades, will always be the sign of your strenth and inner growth. You are more beautiful everyday!!! I don't know you, and I just discovered your blog, but I admire your strength and your courage to post this and be so open about it. I'm following you from now on, because you have amazing style and love your blog! that last photo is amazing. you're right - the dress frames your scar beautifully. i have chronic fatigue syndrome and fibromyalgia - both of which are invisible - but sometimes i really wish there was a way i could incorporate the experience of them into my fashion choices. i think there's something empowering about being able to take something that causes/ed so much strife and re-imagine it, wonderfully. i envy your courage and the way you deal with your scoliosis. so so admirable! you are such a stunning girl! I was directed to your site by a friend of mine who saw your great post Silver Sighs and thought I would be interested as I also have scoliosis and had surgery to correct it. I think it's so cool to show your scar. I have never hidden mine and I think your dress showed it off beautifully. hey i just found your blog randomly and this post totally caught my eye because i have the same scar from scoliosis surgery and am always looking for cut out back dresses to show it - its hard to find many! ive even thought about altering a lot of my clothes because i love the way it looks. it was weird to come to terms with for a while but i do feel like exhibiting it is 'owning' it in a way - somehow it makes you feel like you have control over something that maybe you didnt have control over. you know? anyway its cool to see someone else with the same attitude about it. Wow, you are very strong and brave. As the rest of us say, you stand out as an even stronger and more beautiful person. You are amazing. My scar is only 13 cm but I hide it. I was going to say that I hope I would someday be as brave as you are, but no. This is my new goal. Someday I WILL be as brave as you are. Thank you.